King Robert and Ned had some amusing moments to start "The Wolf and the Lion." It seems no matter what your role, it's never what you think it will be. As Robert said, "I thought as King I could do whatever I wanted." By the end of the episode, he proved that he very well can. When our road weary travelers were attacked, you could see Tyrion weighing his decision: flee or save Catelyn? If anyone had any doubt that Tyrion's soul was clear, it was eliminated here. Granted, the thought of being ripped to death by wildlife may have played into his final action, but he made the choice with his heart, not his head. George R. R. Martin has not even finished A Song of Ice and Fire, but surely Tyrion will be proven the man I think he is by the end. The entire council of the King were at each others throats. Things were coming to head, and whatever that means, it will not be good. Thanks to Arya and her penchant for adventure, she overheard some council members saying the Wolves and Lions would soon be at war and that the Hand had found one of the bastards. There are obviously secrets the council shares, but not with Ned, nor with the late Jon Arryn. The Hand of the King has few allies. I wish Catelyn had been in contact with her sister before deciding to take Tyrion there. She's a nutter, as the Brit's like to say. I daresay Lysa doesn't even like her sister, and it wouldn't surprise me at all if she made the little man fly to make her son happy. The dungeon was certainly a startling vision, wasn't it? As if Ned's head wasn't already swirling, word got to King's Landing that Catelyn kidnapped Tyrion and that Dany was pregnant with Khal's child. It felt like the train was ready to run off of the rails. Dany and Khal Drogo seem so far away from King's Landing that I hardly thought of them as a threat. It appears the reality is quite different. Ribert ordered all of their deaths and, as a result, Ned resigned as Hand of the King. The King already called him a traitor, so the Starks must beat a hasty retreat from King's Landing. Poor, honorable Ned barely had a chance to take the reins of the Kingdom before he realized how far the King was from the friend Robert used to be. 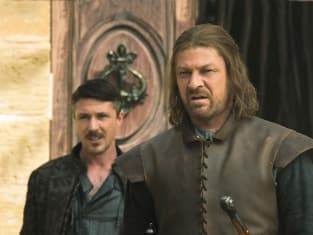 Was anyone else surprised that Cersei somewhat stood up for Ned after he resigned? Asking Robert if losing Ned this was was really worth it? She considered him a serious enough man to be the Hand. High praise from her lips for a Stark. Cersei has turned out to be quite an enigma. Sometimes I have no idea where she truly stands, and then she comes out with some fairly wise words. The torture King Robert suffered after losing his only true love lasted all 17 years of their marriage. He was so busy being tortured, he wouldn't allow himself to have something with Cersei, even though at one time she was open to the idea. It makes her turning to her brother for affection a lot easier to understand. There wouldn't be many men a queen could trust for a tryst, let alone more than one. Jaime sought out Ned to answer for his missing brother. Without a title, Jaime used his power to wipe Ned clean. Ned's two girls are without protection and all of Ned's men are dead. Dire circumstances, indeed. The chain of events that were set into place in these last two episodes don't seem to leave a lot of room for the Starks to make it safely back to Winterfell. What do you think the last five episodes will hold? I'm not sure why Gregor went nuts at the tournament, but I loved The Hound saving the day. I hope he feels some honor gained from his actions. Despite knowing Lysa was off in the head,watching her child suckling at her breast (and using it as a sort of pillow to chat with their visitors) really churned my stomach. I didn't expect Renly to be gay. Funny timing, that he was complaining the other men made fun of him for not being manly enough as he was being shaved clean by Loras. Sansa is still engaged to the Prince. How long will that last? I wish Catelyn had thought about her husband and daughters at King's Landing before taking Tyrion prisoner. Did she really think no one there would give it a second thought?